It is just over 3 years since the beginning of the revolution in Libya and we asked the DOS and teachers of IH Tripoli to give us a personal account of how things have changed and what day to day life is now like in Tripoli and at the school. IH Tripoli opened in December 2001 and quickly gained a reputation of being one of the best language schools in Libya. It became part of the International House World Organisation in 2008 and in 2013 was accredited as a Member of EAQUALS, only the second school in the Arab world to achieve this level of accreditation for European standard. It is a Cambridge Exam centre and IELTS Authorised Centre for exams and have a wide variety of classes. During the Revolution in 2011 the school remained open against all odds until July and then restarted classes in October 2011. Although there have been many changes and day to day life has its challenges the schools continues to function very successfully and a great deal of this is due to the great work of the dedicated team of teachers. The DOS interviewed some of the teachers as she felt their personal experiences would be the best way to give an excellent insight into the life at IH Tripoli and in Libya. Pauline McNally – Liverpool, UK. Pauline joined IH Tripoli in September 2013 because she wanted to experience life in a traditionally Muslim country and the school was recommended as a good place to work. She likes the management style, the relaxed atmosphere in the school and the beautiful gardens. “It combines perfectly the intimate feel of a small family concern backed by a reputable international organisation”. Pauline has found the people of Libya she’s met have been very friendly and welcoming and she’s had the opportunity to visit two amazing archaeological sites just outside Tripoli. She’s a keen Liverpool FC supporter has even found a good coffee shop that sells delicious cakes where she can watch the football! However, she said that due to the current security situation the social life is somewhat limited but hopefully this will change in the future. Penny Ward– Winchester, UK. 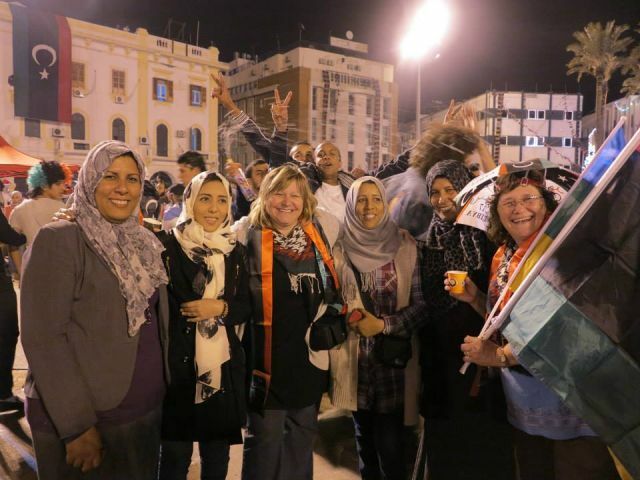 Penny joined IH Tripoli in September 2013 but had worked in Tripoli before the Revolution. She was very keen to come back and to join IH because she says “it is probably the most serious minded English language school in Tripoli at the moment”. She says she really likes the friendly atmosphere and feels that the Director and DOS are very supportive both academically and on a personal level. She also likes the school’s pedagogical approach; different levels have different course lengths to ensure students have sufficient time for thorough study of the material. “Helping people to acquire knowledge (English) that can impact on their lives and benefit them in their work, studies or private lives” is one of the reasons Penny enjoys being a teacher. She said her social life in Tripoli has changed the pre-Revolution days. Prior to the revolution there was a variety of activities for expats, including the Archaeological Society, Hash House Runners and other social groups. Now, however, as the security situation is not as stable, she feels it is too risky to go out of town. Her weekends are spent quietly; on Fridays morning she goes out to meet friends and on Saturdays she goes into town and walks around the old town, goes to cafes and restaurants and shops for things she doesn’t need! Kerensa – Exeter, UK. Kerensa first joined IH Tripoli in 2009, was evacuated during the Revolution, went to work in Doha, Qatar but returned when the school reopened. She says what she enjoys about her job is “watching people gain confidence with English and helping them to progress. Also meeting and understanding people from another culture”. She also really likes the relaxed atmosphere and the nice environment at the school and finds the Director and the DOS very approachable. Karenza says her social life has changed pre and post Revolution but hopes that in the future she will have the same social life, the freedom to go out of Tripoli to the beaches, mountains and go on desert visits which are restricted at present. Laila – Copenhagen, Denmark. Laila is married to a Libyan and has lived in Libya since 1966 and has always worked as a teacher. She taught for the Ministry of Education and the Training Centre for banks before joining IH Tripoli in 2000. Laila enjoys her job because “I like the interaction with the students, seeing the progress they make and the confidence it gives them to know English”. Peggy McNeal – Kansas City, USA. Peggy has lived and worked in many countries as an interior and jewellery designer, an office manager and an architect’s assistant. She joined IH Tripoli in March 2013 because she likes the framework and structured nature of IH. She enjoys teaching at the school as she likes meeting the students. She said “as the mother of a grown son I love having the chance to interact with young Libyans”. She says that life in Tripoli changes from one minute to the next. ‘One day we have a parade of tanks and so-called revolutionaries driving up and down the street with their anti aircraft guns in a show of strength and then next you have hundreds of Libyan football fans rejoicing over the win of Libya in the African Nations Championship. There is never a dull moment. One thing that is constant is the nightly display of fireworks. Jenni van Huyssteen – Cape Town, South Africa. 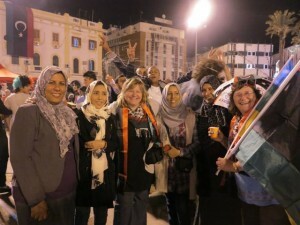 Jenni joined IH Tripoli in January 2013, but she also worked in Tripoli before the Revolution at another language centre. She is passionate about teaching and loves everything about her job, especially seeing students succeed and reach their potential. “As the plane came in to land, the excitement on board was palpable. The city was laid out like a mosaic in the African sun, waiting for us. The wheels touched down, a cheer went up, and then there were smiles and excited chatter as we started gathering our things. On the tarmac, waiting for my eyes to adjust to the bright sunlight, I breathed a sigh of relief and satisfaction – finally, I was home again. It felt like an eternity since I had last stood on Libyan soil, my forced exile 2 years before was still sharp and painful in my memory. I had come to Libya in October 2009, full of excitement and expectation as I embarked on my first full time English teaching adventure. Life in the capital under ‘the Colonel’ was basic but comfortable, and I soon made many Libyan friends. I quickly learned the basics of the Libyan dialect, determined to assimilate and ‘fit in’ as much as a foreigner possibly could. I loved life in Tripoli, finding the cost of living so much cheaper than anywhere else I had ever been. People were friendly and hospitable, and determined to look after the visitors in their midst. It was certainly the safe and my colleagues and I thought nothing of walking the streets downtown at midnight, going to or from restaurants and meeting local friends. However, I soon noticed, among my students and friends, that there were certain ‘taboo’ topics, such as any comment whatsoever on ‘Brother Leader’. There was an atmosphere of fear underlying everything and a wariness of any stranger. But as I had been made aware of this all during my induction, I learnt to live with life as it was in this most controversial of African countries. My Libyan friends were keen to show me their capital and their country, and my colleagues and I were taken to such wonders as Ghadames, The Nafusa Mountains, Leptis Magna and Sabratha. A fellow South African and I even joined a local tour company for a 5-day luxury tented trip to the south during Eid, visiting the Akakus mountains, Ubari Lakes, Gaberoun and the Sand Dunes – an unforgettable experience! Then came 17 February 2011. A day that in Tripoli, at least, passed by relatively peacefully. However, this soon changed, as the regime realised just how determined the Libyan people were to rid themselves of this terrible yoke of oppression they had suffered under for so long, and retaliation was sharp, swift and deadly. Soon the finger was pointed at ‘the foreigners’ for being the perpetrators of the rebellion and my government decided it was time to evacuate us. It was with a heavy heart and many tears that I and my fellow South Africans took off from Matiga Airport on Sunday 27 February. I wondered just when, if ever, I would see my friends or this beautiful country again. I was able to briefly share in the Libyan drama, when I returned to the east of Libya during the war as part of a medical team, delivering equipment and supplies to Benghazi, which by then was liberated and enjoying their newfound freedom. I was included as I was the only one able to speak some Libyan Arabic and who had experience of the Libyan people. What an awesome privilege that was, to be able to share in the joys and pain of a country at war. Everywhere we were welcomed by revolutionaries and one old man approached me and with tears in his eyes said: “Please, tell the world – we are not terrorists, we just want our freedom”. Finally, the moment arrived, and I returned to Libya in January 2013 to begin a new life, hoping to be of some use in post-revolution Libya as the people are now desperate to develop themselves in ways previously denied to many of them. So what is life like now compared to ‘before’? Well, the cost of living has gone up, at least in the capital. Nevertheless, it is still much cheaper here than in most other places I have lived. The people are going about their daily lives and life is more or less ‘back to normal’. I still see many friendly faces and most are even more grateful now to see a foreigner in their midst as there are so much fewer of us around. Safety and security is an issue, of course, but this I see as pretty normal for a country living through the aftermath of a bloody revolution. The previous regime had brought this country and its people to their knees, and so now everything has to start virtually from scratch. And yet, the people are free! This is the most important change that has happened, in my opinion. Finally, people are not afraid to speak out against anything – the present government, the infrastructure, the cost of living, the fuel, anything at all can and does get debated and discussed on street corners, in cafes and on Martyrs’ and Algeria Squares! There is a vibrancy here now that was not even possible before. Yes, 2 years after the end of the revolution people are disillusioned as most expected it all to be an instant paradise, only to find that some things have not changed at all and others are moving forward much slower than expected. Yes, there are constant grumblings against the present government and calls and protests to try and get them ousted (The fact that this is now even possible to do this is forgotten by some!) and there is no constitution yet. Yes, security is still somewhat of an issue. However – there is hope where there was none before. There is life where there was only death and dying. Slowly the educated are realising that they are in for the long haul, and that change does not happen overnight – but there IS change. Just a month ago, I watched as the Libyan National Football team win the African Cup of Nations for the first time ever and rejoiced as the goalie was made “Man of the Match” In the previous regime, it was forbidden for a team member to have his name printed on his jersey – they were only allowed to be ‘numbers’ Last week a friend and I took to the streets as the city celebrated the anniversary of the 17 February Revolution, and joined the street party on Martyrs’ Square and in my old neighbourhood, Mezran Street! Everywhere people welcomed the “foreigners” in their midst, and showered us with gifts as we were invited to celebrate with them! In November last year I visited Benghazi for the first time since the war, curious to see the changes to this city and wary of how I would be received due to all the rumours and reports in the news. To my surprise, I discovered a city full of hospitable and friendly people. Everywhere there are signs of growth and new life as the country is being rebuilt slowly but surely, both literally and figuratively. My challenge and invitation, therefore, to everyone still a bit fearful and unsure is: don’t believe everything you read in the newspapers! Instead, come and see for yourselves! If you have a sense of adventure, a willingness to learn from the local people and discover something new and different, if you are the kind of person who likes to add value to people’s lives, if you don’t expect everything to be ‘just like home’, but are willing to experience new tastes, a new culture and wonderful people who actually want to learn – then Libya is the place for you!